The e-Learning for Agriculture and Fisheries is a major component of the Philippine's Department of Agriculture's e-Extension Program, with the Agricultural Training Institute as the lead implementing agency, in collaboration with other government agencies, state universities and colleges and nongovernment organizations. from 8am to 6pm Mondays - Fridays, except holidays. 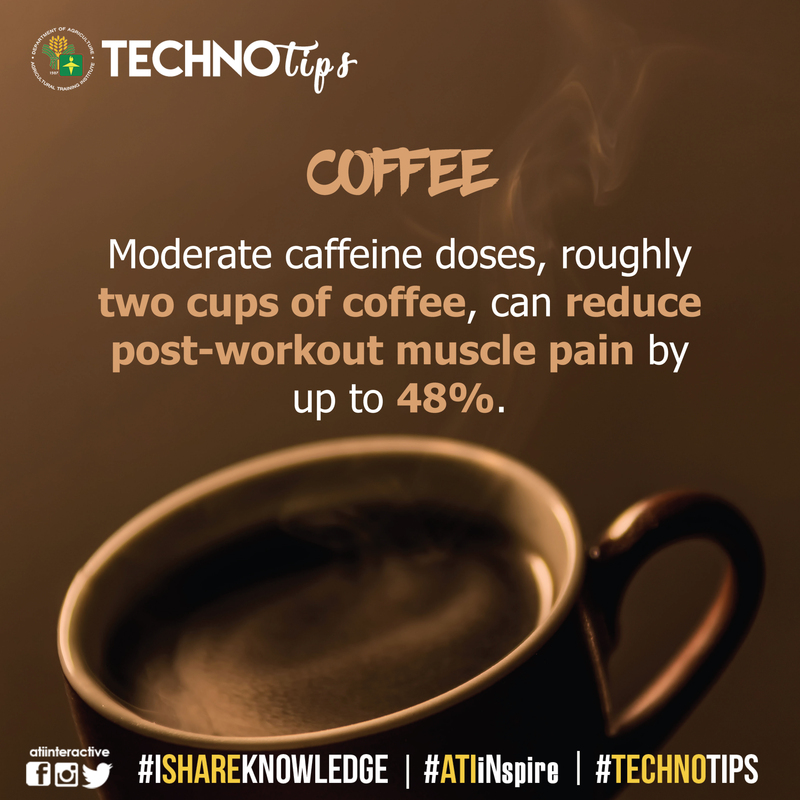 In 2015, a small study from the University of Georgia in the USA found that two cups of coffee before a workout reduce delayed onset muscle soreness (DOMS). Caffeine blocks the body receptors for adenosine, a chemical released from body cells in response to inflammation. DOMS is a muscular pain and stiffness that occurs after a heavy body workload. Coffee is also a good source of income. It is second to crude oil among the world's most traded products. Water is essential to the survival of humankind. As the population continues to grow, the need for water increases significantly—not only for drinking, but also for growing food and providing proper sanitation. Use water more efficiently by turning off the tap while brushing teeth or doing the dishes and by fixing dripping taps in your home. 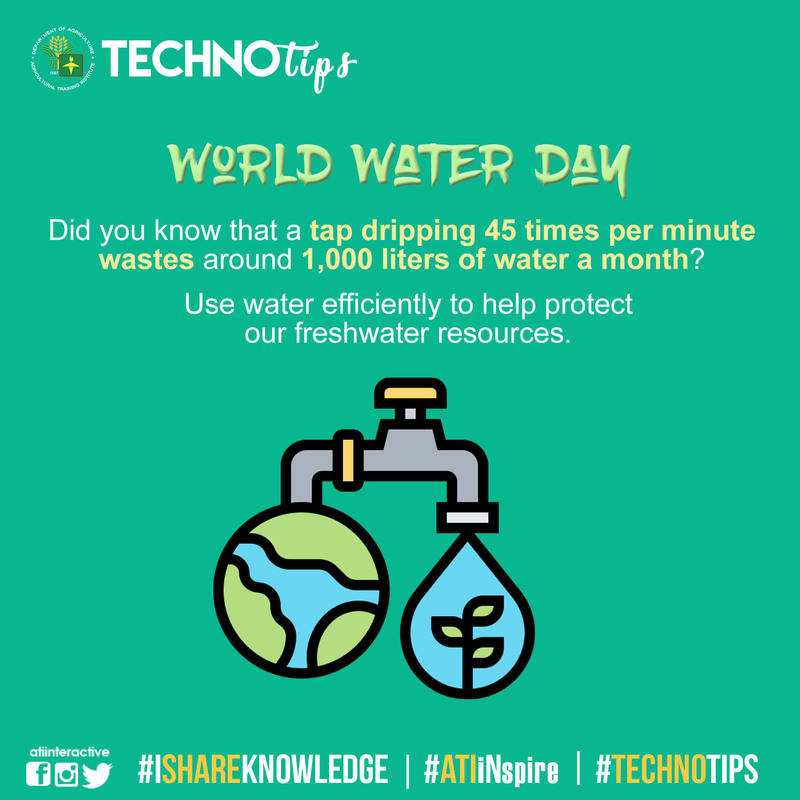 This World Water Day (WWD), let us make water conservation a conscious effort to ensure that every household, school, workplace, farm, factory, and other establishments have access to the safe water they need. In the Philippines, the week-long event centers on the localized theme “Hawak-kamay, Tubig Kaagapay”. Different activities will be held to tackle the water crisis so that all individuals can have ample water supply, regardless of any condition. Make everyday a World Water Day. We continue to celebrate stories of all women in the country this National Women's Month, in recognition of their significant contributions to nation-building. This year’s celebration focuses on strengthening efforts to improve and track the progress of the implementation of the Magna Carta of Women, and other relevant laws and commitment to the international community. These include the Convention on the Elimination of All forms of Discrimination Against Women, the Beijing Platform for Action, and the Sustainable Development Goals. Women play integral roles in the field of agriculture. 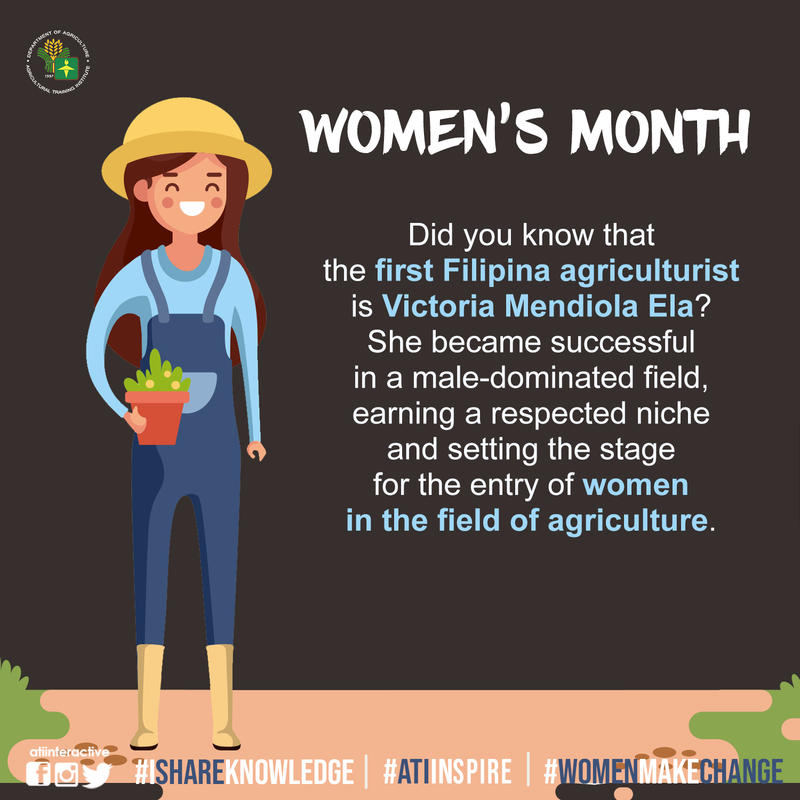 Victoria Mendiola Ela is one who made her mark in the sector as the first Filipina agriculturist. She is known for her outstanding contributions in plant pathology and as the only woman chairperson of the Department of Plant Pathology in the College of Agriculture of University of the Philippines, Los Baños. To showcase the achievements of women like Ela, the Agricultural Training Institute will spearhead a symposium on “Women in Rice Farming” on March 25-29, 2019. This will feature a knowledge-sharing and learning among women rice farmers in the country. Invited speakers and participants will talk about their best practices in rice farming as well as the different roles women can play in agriculture. Want some additional tool to aid you on your crops? No worries as we got you covered. 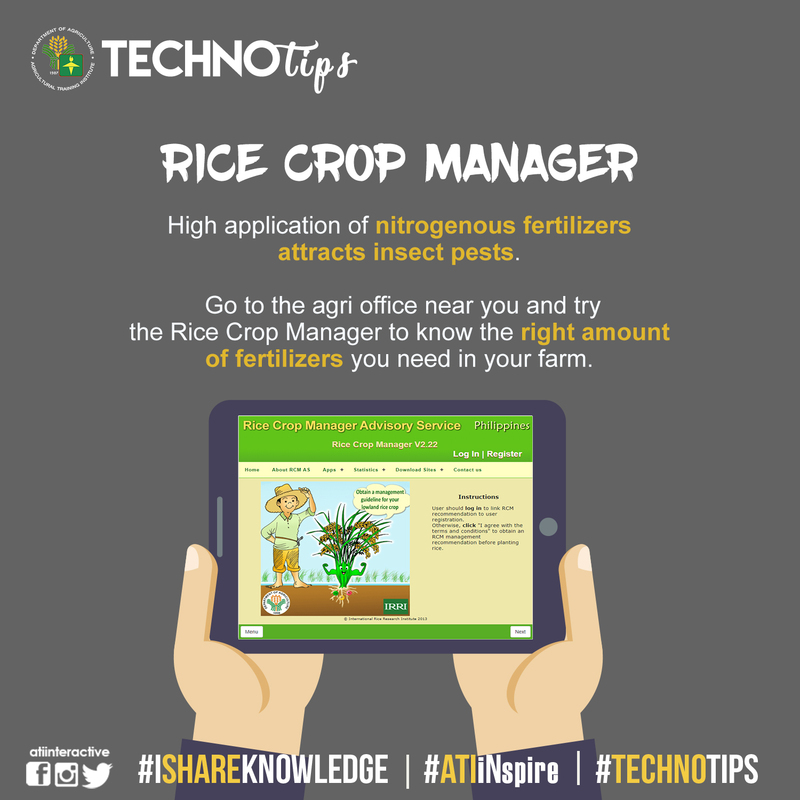 The Rice Crop Manager (RCM) is a decision-making tool which provides small-scale rice farmers with crop and nutrient management advice customized to farming conditions and needs. 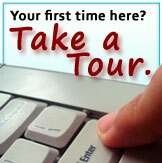 It is accessible through the web browser on computers and smartphones. This is used by extension workers, crop advisors, and service providers to give farmers a specific recommendation on nutrient, pest, weed, or water management. This depends on the specific variety they used, their yield from the previous season, and the site-specific conditions of their field. For instance, too much fertilizer application, specifically nitrogenous ones, may attract insect pests. With the help of RCM, you can determine the recommended amount of fertilizer you need in your farm. Also, this modern technology may attract younger generation to dwell into farming which will improve the agricultural industry. Great, isn't it? 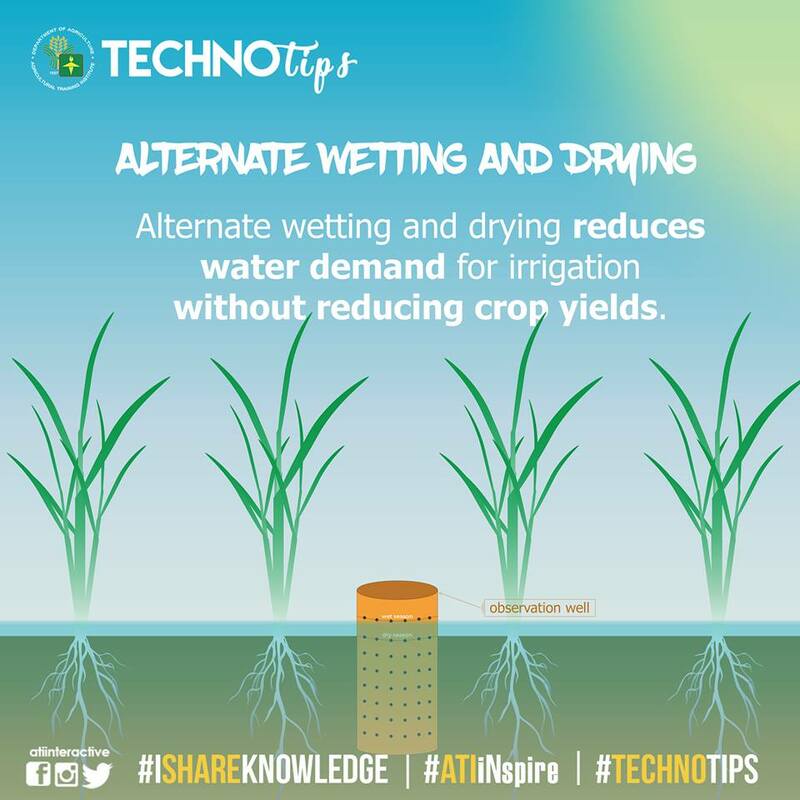 Alternate wetting and drying (AWD) reduces water used in rice production by 16-35% without affecting grain yield. It also increases the efficiency of plants in using soil nutrients and applied fertilizers. AWD helps in controlling weeds and minimizes golden apple snail damages. It is a simple yet water-wise farm practice that can be used to increase the efficiency of farm inputs and help the plants grow healthier. good day po. pahingi po ng enrollment key ng saving the lost harvest: introductory course on rice post production technologies thank you. hello good day, pa confirm po ..
goodmorning po. pahingi po ng ekey for Fundamentals of Community Organizing thanks po. Is it possible to take more than 1 course at a time? Pahingi po ng enrollment key para sa banana 3.
phingi po ng enrollment key ng ABC of pig production po, thanks! good pm po pwd pahingi ng key sa seed to seed corn production..
pahingi po ng e-key ng Hail the Quail thanks po..